A widget class that contains simple controls for a MarbleWidget. 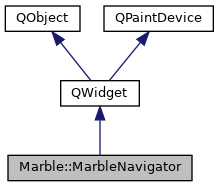 This widget lets the user control an instance of MarbleWidget. The user can control panning and zooming as well as returning to a predefined view called the 'Home' position. You cannot change the Home position from the MarbleNavigator, though. Definition at line 49 of file MarbleNavigator.h. Definition at line 33 of file MarbleNavigator.cpp. zoom The new zoom value. This slot should be called when the zoom value is changed from the widget itself, e.g. by using the scroll wheel. It sets the value of the slider, but nothing more. In particular it doesn't emit the zoomChanged signal. Definition at line 75 of file MarbleNavigator.cpp. Signal emitted when the Home button has been pressed. Return the minimum zoom level set in the widget. the minimum zoom level set in the widget. Definition at line 69 of file MarbleNavigator.cpp. Signal emitted when the Move Down button has been pressed. Signal emitted when the Move Left button has been pressed. Signal emitted when the Move Right button has been pressed. Signal emitted when the Move Up button has been pressed. Reimplementation of the resizeEvent() of the widget. If the MarbleNavigator gets shrunk enough, the slider will be hidden, leaving only the Zoom Up and Zoom Down buttons. Definition at line 84 of file MarbleNavigator.cpp. Signal emitted when the zoom slider has been moved. Signal emitted when the Zoom In button has been pressed. Signal emitted when the Zoom Out button has been pressed.